Heat oven to 400°F. 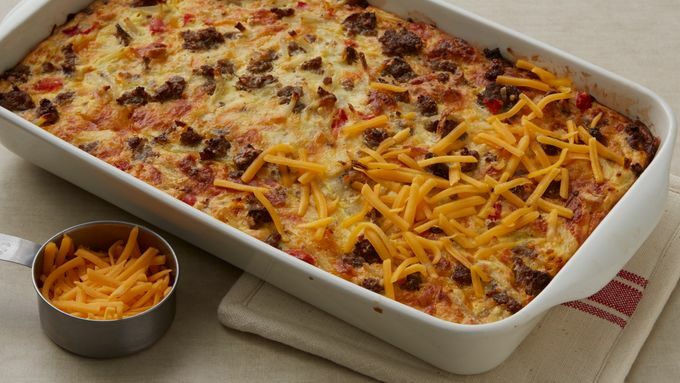 Grease 13x9-inch (3-quart) baking dish. Cook sausage, bell pepper and onion in 10-inch skillet over medium heat, stirring occasionally, until sausage is no longer pink; drain. Stir together sausage mixture, potatoes and 1 1/2 cups of the cheese in baking dish. Stir Bisquick™ mix, milk, pepper and eggs until blended. Pour into baking dish. Bake uncovered 40 to 45 minutes or until knife inserted in center comes out clean. Sprinkle with remaining cheese. Bake 1 to 2 minutes longer or just until cheese is melted. Cool 5 minutes. 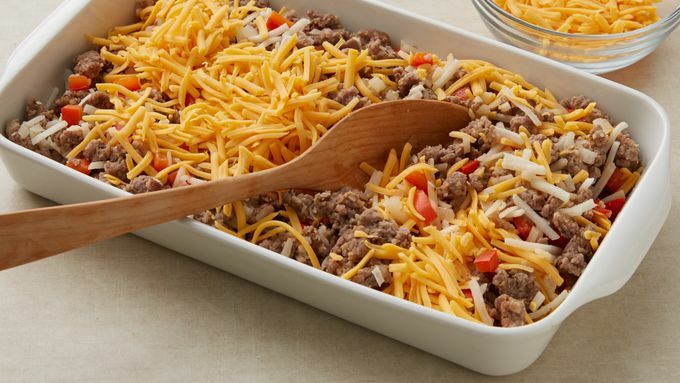 Make up to 24 hours ahead, covering and refrigerating the casserole until 15 minutes before baking. Remove from the fridge while the oven heats up, then keep an eye on the doneness as it may take a few minutes longer since the food is chilled. Take liberties in your ingredient choices: sub in bulk apple-pork breakfast or Italian-seasoned sausage or shred up some pepper Jack or smoked Gouda cheese to step up your brunch game. Smaller crowd? Divide the ingredients in half and layer each in two 10-inch deep-dish pie plates. The smaller pies will take 30 to 35 minutes to bake. Face it: waiting in line for brunch is a loser’s game. The smart kids are opting to make a crowd-worthy, one-dish meal, then host an in-home brunch-a-thon instead. Ask friends to bring along some drinks and sides, but everyone probably will be content just to fall face first into this irresistible combination of potato, sausage and cheese (aka, the only three things you need to make a perfect meal). 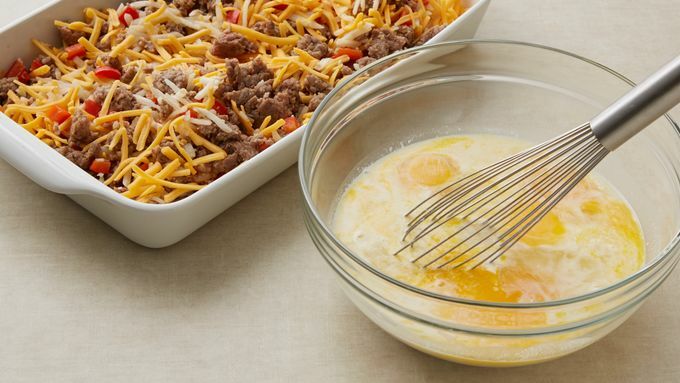 If you’re nervous about pulling this breakfast casserole recipe together, never fear. It’s a top-rated recipe that has already become a classic with home cooks everywhere. Best of all, it makes 12 full servings, so there might even be room for seconds—or Sunday night leftovers. 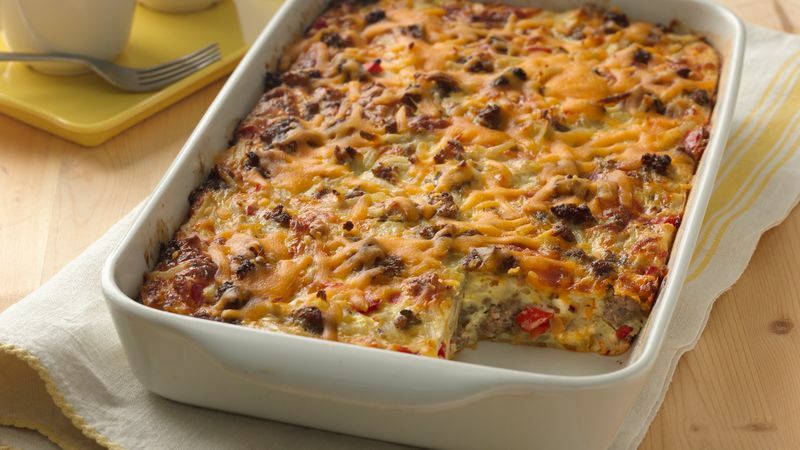 Now that you’ve been crowned the reigning monarch of breakfast casserole, check out Betty's best breakfast bake recipes.